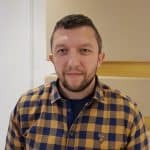 Perhaps you converted some images online from one format to another, on your desktop PC, sent them to your Android phone via Send Anywhere, AirDroid, Filedrop, or SHAREit, but then you realized they are too big and decided to resize them so they will take up less space. 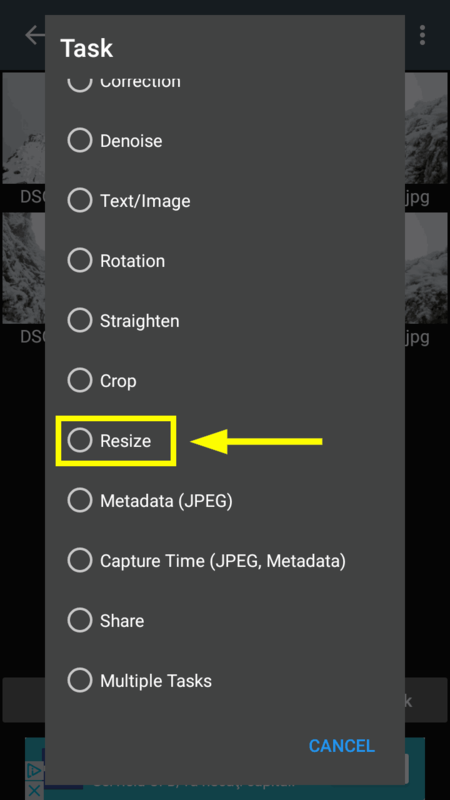 Instead of going back and resize everything on your PC, then transfer again, here’s how to do the resizing, in bulk, for free, straight on your Android device. 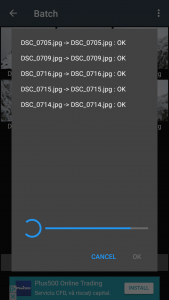 This guide can also come in handy if you wish to reduce space on your Android device by scaling down a lot of photos you took at the maximum resolution your phone or tablet’s camera allowed you to, or if you need smaller resolution pics to attach to an email. Photo Editor is an Android photo editing app, obviously, but it does stand out from the crowd of photo editors due to its powerful capabilities. From out point of view, this photo editing app offers to Android users the closest thing to a desktop photo editor experience they can get. Besides that, it comes with batch tasks, which fit this guide perfectly. 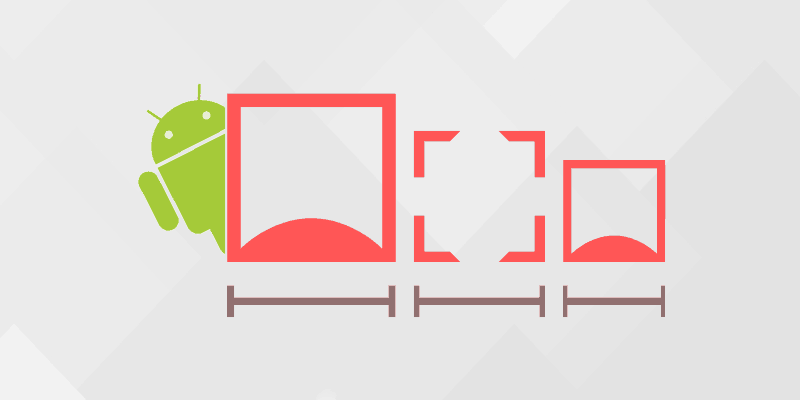 There are other photo resizing apps on Google Play, but from our tests, Photo Editor outperformed them all, even though its resizing task is not advertised as one of its main features. 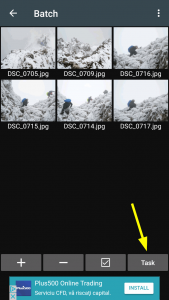 If you do happen to know of a better app to resize photos on Android, drop a comment below the guide please. 2. 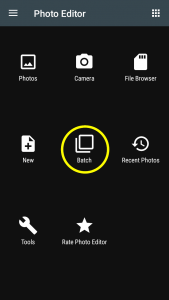 Open Photo Editor and from the main window, tap on “Batch”. 3. On the next screen, tap on “+”. The other options here are grayed out until you add some images to the list. 4. 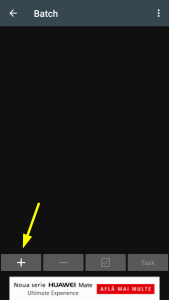 The next screen shows a file browser. Navigate to the folder where the pictures you need to resize are and select the ones you want to process. 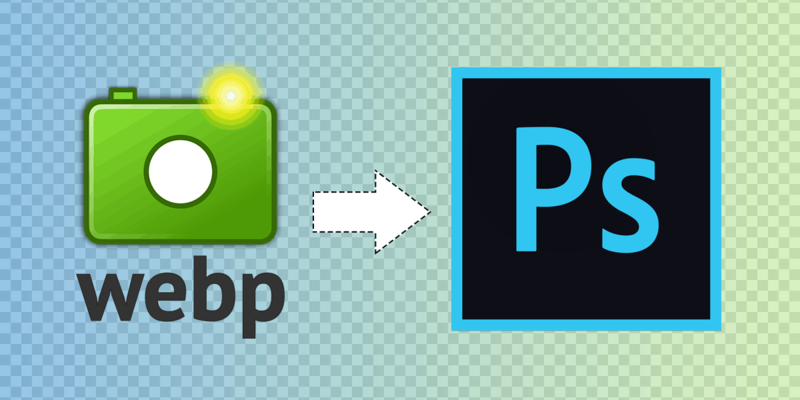 Photo Editor can open JPEG, PNG, BMP, GIF, and WebP. You can tap on each picture you want to select, or use “Select All”. You can also tap on the settings icon and sort them by name, date, size, ascending or descending. 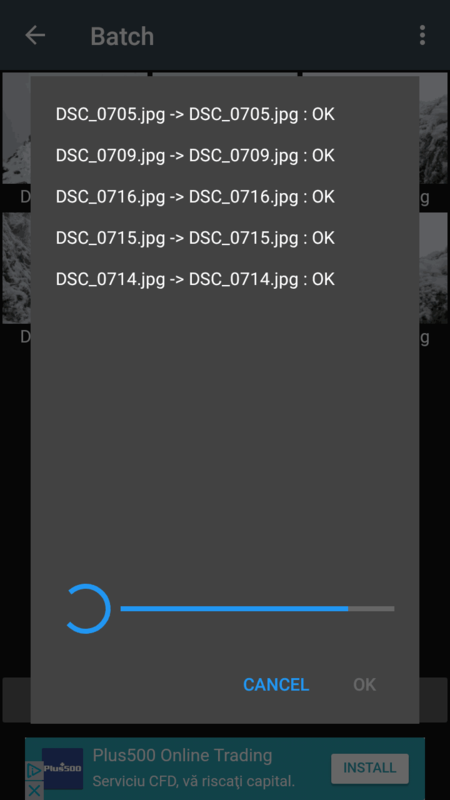 You can view the images as thumbnails or as a list with smaller thumbnails. Once you made your selection, tap “Done”. 5. Tap on “Task” (previously grayed out) in the next screen and you’ll see a list of tasks that Photo Editor can perform to multiple images at once. 6. Scroll down to “Resize” and tap on it. 7. In the next screen, you can customize the resizing process. You can choose width and height, downscaling or upscaling while keeping the aspect ratio, or not. You can select an output folder and you can also apply a template name to the output files. Besides that, you need to select an output file format. 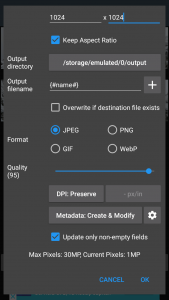 JPEG at 95% quality is selected by default, but you can also go for PNG, GIF, or WebP. 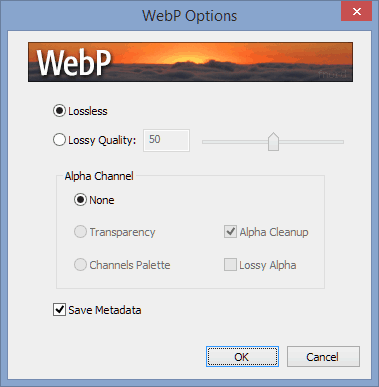 One quick tip is to go for the WebP file format if you wish to have the smallest size possible. The app offers here pretty cool, advanced options as well. 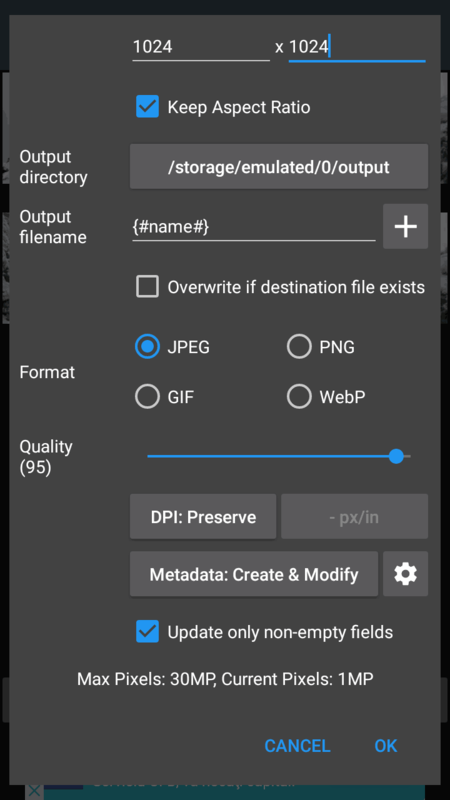 For instance, you can change or preserve DPI and you can even modify Metadata. A nice feature is that you can opt to fill in all metadata fields except the ones already filled in. All these extra features in one place – that is quite awesome! Once you are satisfied with the settings here, tap “OK”, then tap “START” on the next dialog box telling you “Batch job can take a lot of time. Are you ready?”. 8. That’s it. Nothing else to do except wait for the batch resizing task to finish. We hope you found this guide helpful and if you will keep using Photo Editor, we are sure you’ll love the rest of the features it has to offer too. The already discreet ads shown at the bottom of the app’s screen can be removed by purchasing the ad-free version in Settings -> Purchase Items.